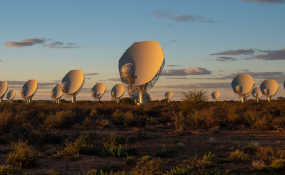 Some of the 64 radio antennas of the MeerKAT telescope in the Karoo, 90km outside Carnarvon. A historic international treaty was signed this week to establish the Square Kilometre Array Observatory, which will oversee the building and operation of the Square Kilometre Array for the next 50 years. After three-and-a-half years of negotiations, seven countries -- South Africa, Australia, China, Italy, the Netherlands, Portugal and the United Kingdom -- signed a treaty in Rome, Italy, on Tuesday. The SKA Observatory is now an intergovernmental organisation, only the second one in the world dedicated to astronomy, other than the European Southern Observatory. Dr Catherine Cesarsky, chair of the SKA Board of directors, said this Tuesday in a video message: "This signature is the real beginning. This is a historic date that everybody will remember." She added that the SKA will be used for up to 50 years and "you want to be part of this fantastic human adventure of the human mind; I expect many countries will join and that it is truly going to be a world project". This means South Africa can soon benefit from contracts awarded to construct the world's largest radio telescope. Read the full story on Daily Maverick. Copyright © 2019 Daily Maverick. All rights reserved. Distributed by AllAfrica Global Media (allAfrica.com). To contact the copyright holder directly for corrections — or for permission to republish or make other authorized use of this material, click here. South Africa to Pioneer Regulation of Airbnb on the Continent? South Africa: Smoke, Spies and Lies - Should You Throw Away Your e-Cigarette?